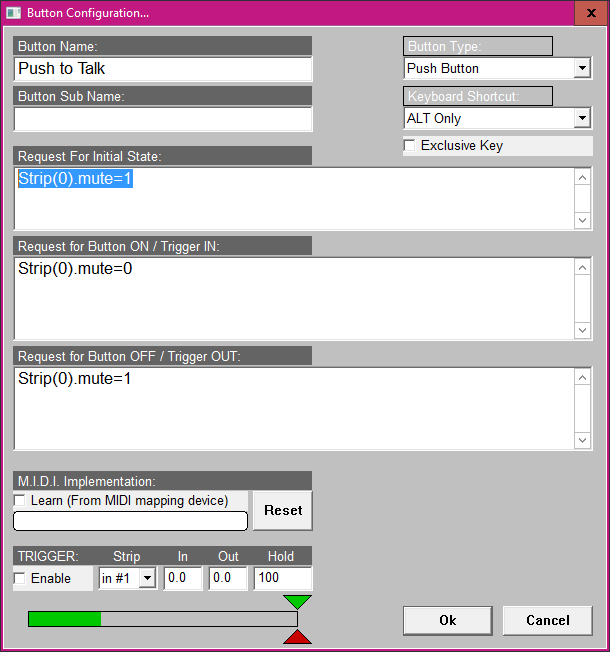 Push to talk mic key? I use my caps lock for push to talk on Teamspeak....how can I add shot with mic WITH push to talk? Vapor.i , thanks for asking! Unfortunately, we do not currently have the ability to do that. It's not that it would be hard to do, you are just the first to have shown interest in it. As we are still developing new features constantly, we have been doing our best to put in the features most requested first, and setting things up for all the exciting new features coming this year. I did go ahead and put in a development request in for this. We are looking to improve our global hotkeys at some point, and that would be a prime time to address this. My audio setup usually involves Voicemeeter Banana, and Noisegator. This ends up shutting off the mic whenever I am not talking. Not the same I know. But you can set up PTT in Voicemeeter Banana! I watched the video but I don't see where you clicked in the program to bring up the screen to toggle the mute button on the mixer with the caps lock screen could you show the exact steps please? Also is it possible that you could add push to Talk in your software for the microphone I don't like leaving my mic just wide open.. Their is alot of background things that happen very quickly and in some cases I would much rather not accidentally air anything..
Next install the software along with following the prompts for system reboot.. Make sure your audio settings are correct with in windows pointing everything to your newly installed software.. I won't be posting a video on this.. Here is where I got lost and decided to post my video..
We will likely add PTT in the future, but at this point in time, we have had maybe 4 requests for it, so it is not very high priority. Hey there i geuss im the fifth but i could really use a PPT option, as i am sitting in the living room with some very loud kids at times and that makes it really hard to have the mic on. even with third party options that only engage the mic when hearing "a voice" that still means that loud kids will activate it. In my thoughts I would have figured a ptt button would have been the first thing designed for a software that is pay ware.. Wasn't meaning this in a bad way but just why did no one feel that push to talk or push to mute wouldn't be useful or a priority? PTT is most often regarded as a huge no no in streaming. We have had almost no requests for it. We also have hotkeys and multiple master layers. Keeping your mic on the bottom master layer allows for one button to switch to the mic, and a second button to turn it off. We have had it as a potential feature since before GS was released, but with almost no interest in it, we have spent our time on other features more highly requested. Has there been any progress on the PTT option? What I'm looking for is essentially, using one key bind to talk to my discord (without it going to stream) and another key bind to talk specifically to the stream. From what I've been able to figure out so far, it's an all or nothing situation. Am I missing something here? 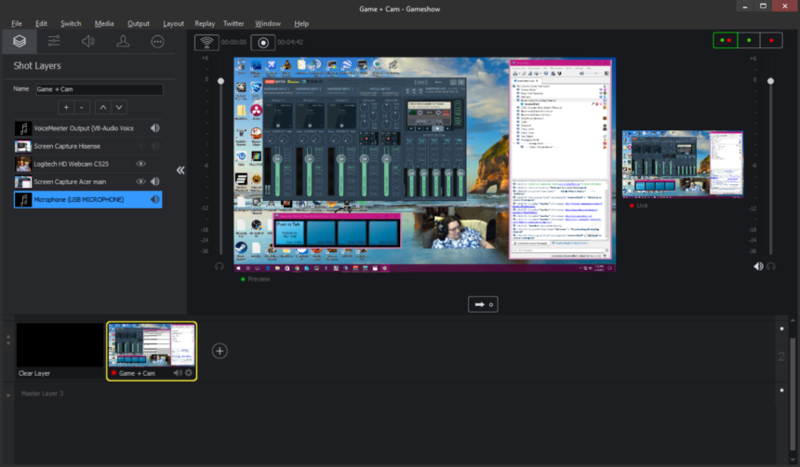 What I've currently got set up is two microphone shots, one muted, the other live, with Autolive on, so I can switch between the mute/unmuted shots on the fly. Hulagar As Bryce notes there hasn't been much interest. Note that your post is first to this thread in about a year. Your workaround is one good way to handle it. Sorry.